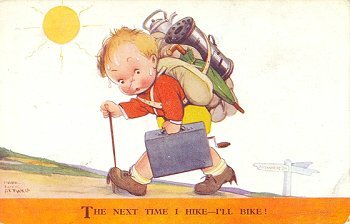 Title: 2187 - The Next Time I Hike - I'll Bike! Publisher: Valentine's "Attwell" Postcards. 2187. Copyright. "Dear Betty, Thank you for your card, so glad to hear you are having a nice time, and hike's in the car, I expect you prefer that way, to the way the boy on this card gets about, I am sure I should. With heaps of love, Queenie"